The Forza Motorsport series has long been one of the major players in the world of racing simulators and when Forza Motorsport 7 launches on the new Xbox One X this fall, gamers will experience the next generation of the legendary driving title. FM7 maker Turn 10 Studios has promised that the new game will offer more than 700 different vehicles and over the past few weeks, the company has been announcing short lists – with the most recent being a compilation of the American vehicles on Forza 7. Included in that list of 101 American vehicles are 26 models from the FCA/Chrysler Corporation brands, highlighted by the record-setting 5th generation Dodge Viper American Club Racer (ACR) and the insanely popular Dodge Challenger SRT Hellcat. Below is a breakdown of the other FCA/Chrysler Group models which have been announced thus far for Forza Motorsport 7. While there are technically 8 FCA/Chrysler Corp brands included thus far in the Forza Motorsport 7, the Dodge brand is the best represented with 10 vehicles. 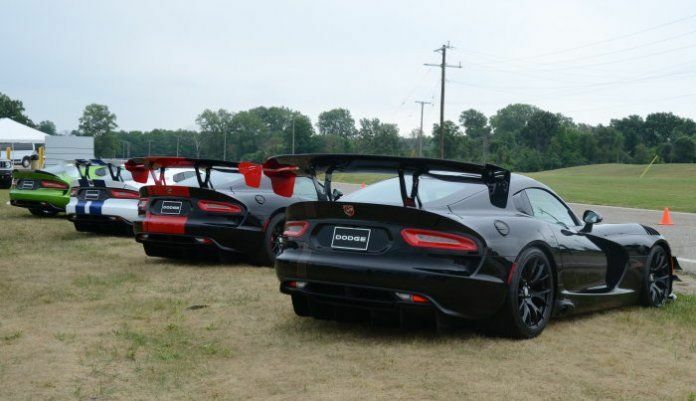 The most prominent performers from Dodge are the 2016 Viper ACR (which just set a 7:03 record lap at the Nurburgring) and the 707 horsepower Dodge Challenger SRT Hellcat. There are also a few classic Dodge models included (70 Challenger R/T, 70 Coronet Super Bee), a couple new and classic compacts (Omni GLHS, Neon SRT4, Dart GT) and a few other muscle cars (2012 Challenger and Charger SRT8), as well as the 1999 Viper ACR. Also, while they are technically not Dodge products, the 2013 SRT Viper GTS and the 2013 Ram Runner off-road race truck are both included in the first FM7 vehicle list. These two vehicles are the only representatives from the Ram brand and the now defunct SRT brand. Jeep is the next most populous brand from FCA in Forza 7, with 6 vehicles on the initial list. The most prominent models from Jeep are the 2009 Grand Cherokee SRT8, the 2014 Grand Cherokee SRT and the 2016 Trailcat Concept, which packs Hellcat Hemi power. There is also a 1976 CJ5, a 1991 Grand Wagoneer and a 2012 Wrangler Rubicon. In addition to the Jeeps, the old American Motors brand has the 1970 AMC Rebel and the 1971 Javelin, along with a 1998 Eagle Talon TSi. The long gone Plymouth brand is next in line with 3 vehicles, starting with a pair of 426 Hemi-powered vehicles from the 1971 model year, along with the unique Plymouth Prowler. Finally, with just two vehicles, the Chrysler brand is the most minimally represented lineup from the FCA brands, with only two cars. However, with the 1972 VH Valiant Charger R/T and the 2012 300 SRT8 – both Aussies and Americans will have a Chrysler car to race in Forza 7. While this is a fairly extensive list of FCA/Chrysler Corp vehicles, I expect that there will be even more vehicles from the Dodge brand when the game is released on October 3rd. It seems likely that the cars from Forza Motorsport 6 and Forza Horizon 3 will be included in FM7, so we are likely to see a 2008 Dodge Viper ACR (which previously held the record at the Nurburgring), the 2015+ Dodge Charger SRT Hellcat, at least one classic Dodge Charger (presumably a 1969 model) and a classic Dodge Charger Daytona – all of which have been popular Forza models in the past.